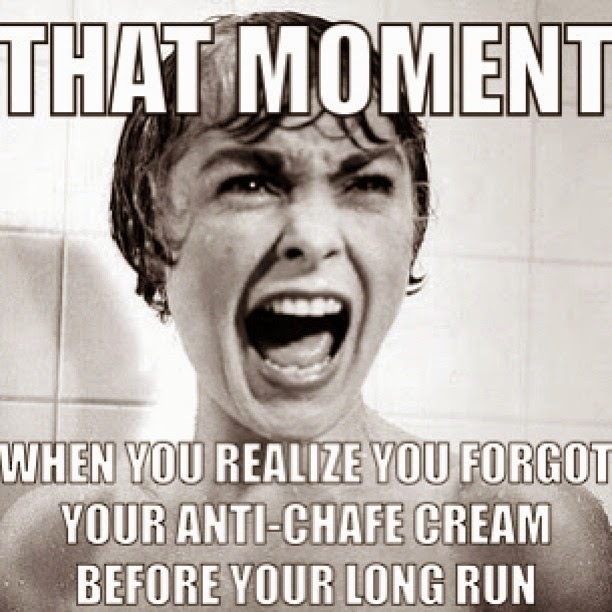 If you're a runner, you know the awful truth of chafing. In fact, there really isn't much worse than when you step into the shower after a run and your skin screams with pain as the water hits it. Often, it's the skin in some already sensitive spot. For me, I tend to chafe on my sternum right where the band of my sports bra hits it. I don't know why. But that spot has haunted most of my running career. I have tried every anti-chafe product on the market. I've tried super goop made for surfers' wet suits. I've tried chamois cream for cyclists. Nothing has ever worked for me. I ultimately resigned myself to a life of screaming in the shower after every sweaty run. Recently I "met" Vito LaBella, with Foot Kinetics, an Encinitas-based company that makes barrier creams for runners, walkers and hikers. Vito is a fellow ultra runner and just finished his first 50-miler, the PCT 50 in May. We were "talking" over Twitter and he asked me to give their RunGoo product a try. My chafed skin and I were eager at the thought of something new to try that may help heal the hideousness. Vito sent over full tubes of RunGoo for me to try. The first thing I noticed was the pretty awesome applicator. Most anti-chafe products require you to apply it directly with your hands. This is fine, in theory. But then you're covered in it and have a hard time getting it off since they're made to repel moisture. This applicator prevents that from happening because you can apply as thick of a layer as possible without ever having to touch it. I also tried it on my feet. I have a callus on the ball of my right foot that sometimes gets a blister (don't judge my runners feet). I applied some RunGoo to the callus before my runs and noticed very little, if any, blistering (sometimes it's hard to tell right away). I would definitely recommend RunGoo to any of my clients or friends. I would also recommend using it for non-running activities where you have chafing problems. Try it on your feet, your waist band and bra band, arm pits (sometimes when you run sleeveless, your arm rubs against your arm pit and chafes), your legs and your feet. Anywhere! You can get it right from Foot Kinetics' website or at select stores across the US. I'm going to give away 2 full-sized tubes of the stuff to anyone that leaves a comment here, retweets this blog post or leaves a comment on our Facebook post about RunGoo. Get your entries in by Monday, 6/9 at 9:00pm PDT (only one method per person, please). Congrats, Nohorse! You won one of the tubes of RunGoo! Let me know the best way to get in touch with you. You can email me directly at jenn@solehealthandwellness.com. Yay you!